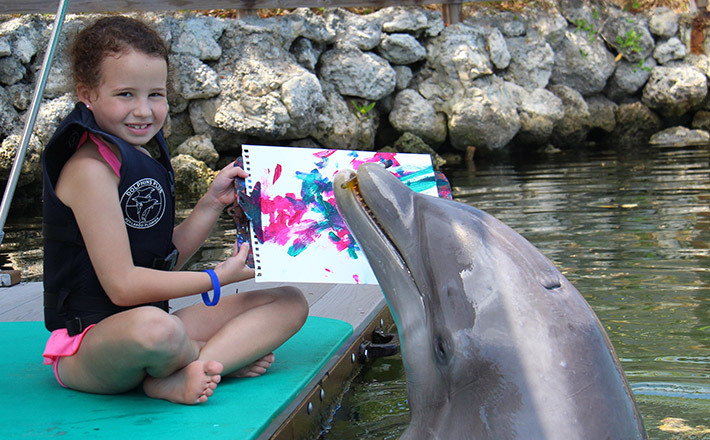 Have a seat next to one of our trainers and watch in awe as one of our dolphins paints a beautiful work of art. Work with the trainer to lend a hand and marvel at the creative, curious and captivating intelligence of these amazing marine mammals. Participants should plan on spending 1 to 1.5 hours at Dolphins Plus from arrival to departure. This includes the education, getting you ready, the encounter itself which is not timed and checking out through our photo department and gift shop. translate in order to take part in the Paint with the Dolphins program. Participants must be at least 3 years of age.